is indeed one of the most spectacular tourist attraction that existed at northeast part of Bali island. as well as capable to attract a large number of tourist visits both from inside or outside the country when they're enjoying Bali holiday tour packages. Because of this beauty also what makes Penelokan region as one of a mainstay tourism owned by Bangli regency. we are from Sorga Bali Tours has provided a full-day sightseeing trip, ie: "Kintamani Bali Volcano Tour Package". 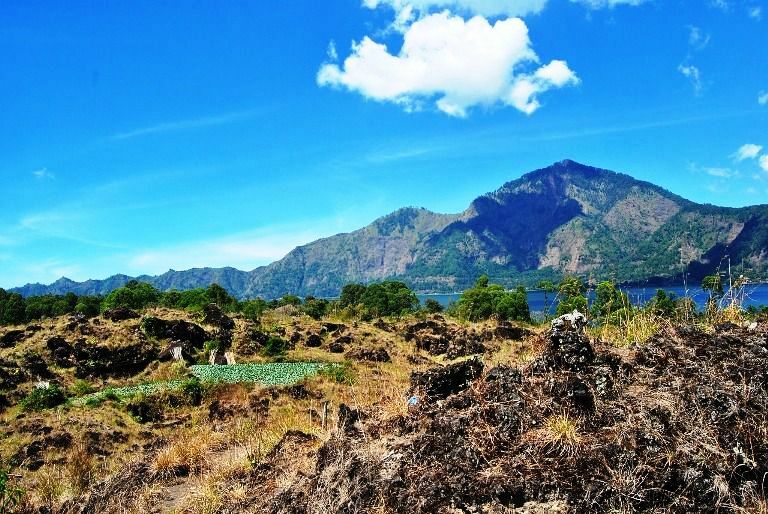 that decorated with the expanse amazing beauty of lake Batur extends about 16 KM2 (Square Kilometres), situated right on the slopes of Batur volcano itself. Kintamani travel itinerary is the most favourite one day trips, specifically offered for you now to be able to explore and enjoy an exceptional holiday experience in it. 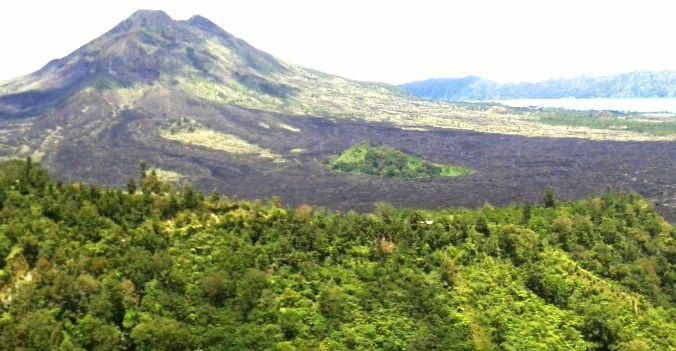 Kintamani volcano tour has an interesting travel schedules, that make this outing becomes one of most wanted recreation options. and enjoying natural scenery especially the charming view of its rice-field terraces (Bali countryside). for you to be able to visit and exploring all the elements with the introduction of all aspects that packed in one day Bali sightseeing tour packages. Regarding schedule of this Kintamani sightseeing, will start with pick up time at 08:30 AM from the place your hotel stay. With cover area around: Nusa Dua, Jimbaran, Sanur, Kuta, Legian, Seminyak, Canggu, Kerobokan, Denpasar City, Ngurah Rai Airport, Benoa Harbor and Ubud. 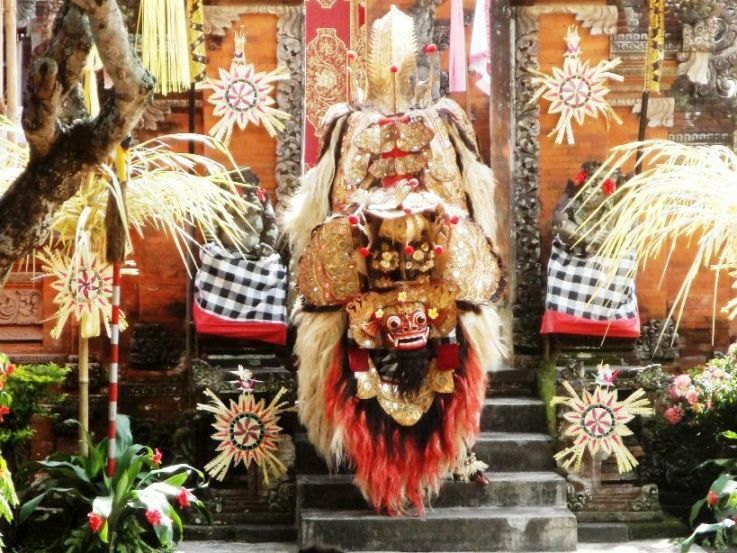 And the aim of first trip will go straight to visit Batubulan village, to watch a traditional Balinese performance ie: "Barong and Keris Dance" for one hour. 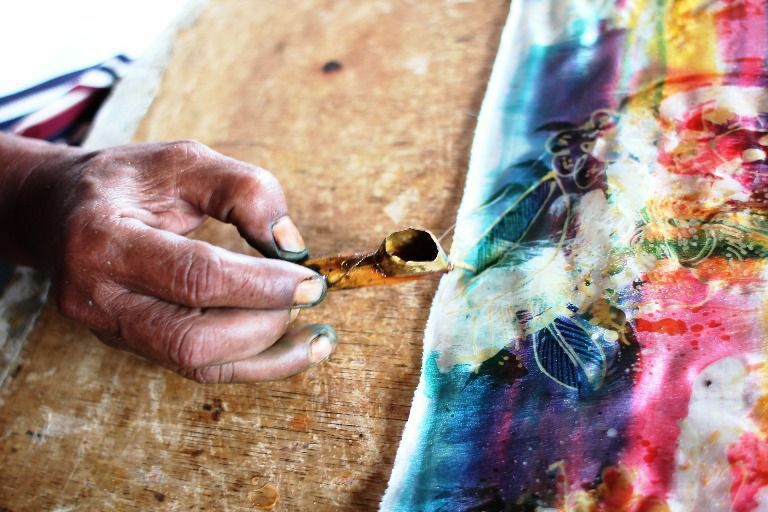 to see the traditional hand weaving and process of Batik cloth handicraft manufacture on the white material. 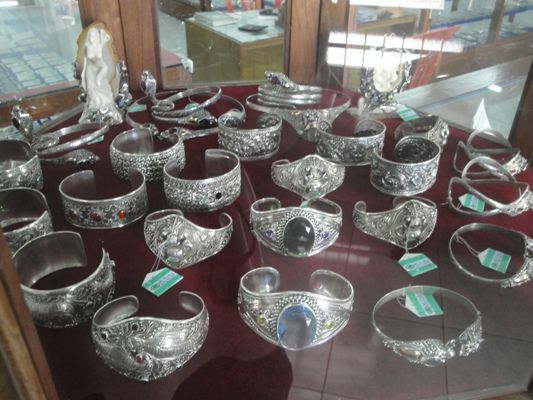 Afterward will visit Celuk village which is so famous as center places of Gold and Silver handicraft in Bali. In this trip you also will see a unique Balinese traditional house compound based on layout concept of "Asta Kosala - Kosali" and "Asta Bumi" (balance concept). 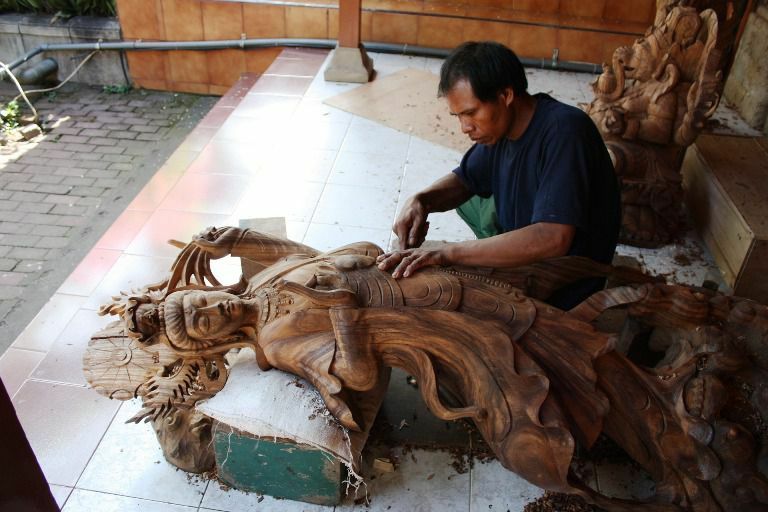 Further destination will lead to Mas village, as centre of Wood carvings, then the journey proceed to visit Ubud art village. Ubud village indeed very popular as valley of artists painting, in addition supported with the existence of its famous galleries art of paintings in here. Thereafter will visit a relic site from Bedahulu kingdom, ie: "Pura Goa Gajah (Bali elephant cave temple)" which built in the 11th century. And this holy place is a religious historical heritages site from "Hindu and Buddhist". Then journey will be continued by visiting Tampak Siring tourist objects (Tirta Empul temple), a sacred area which has big springs out of the ground. The source of this holy spring is generally often used by Balinese Hindu people to do purification (Balinese language: "Pengelukatan"), located in the vicinity of Pura Tirta Empul. For next halt, will walk around to see an area of coffee plantations, fruits, spices and all other types of tropical plants. Also to view the coffee processing that still uses a traditional methode, which located at Kayuamba - Sekardadi - Bangli. As for lunch break, you will be invited to the core area from this Kintamani tour. Where you will rest for one (1) hour while enjoying all kinds of food dishes in a restaurant located at Penelokan village - Kintamani. Kintamani tourist object has a spectacular landscapes overlooking panoramic view of lake and active Batur volcano. Then for last visit before returning to the hotel, will stop at a well-known tourist area of Ceking Village - Tegallalang. This little village is very famous with its rural scenery, especially panorama of rice-field terrace from the existence of Subak Tegal lalang - Gianyar. Regarding duration from Kintamani holiday excursion will take around 7 to 8 hours or maximum 9 to 10 hours, which will be started at 8.30 AM and end at 06.00 PM. 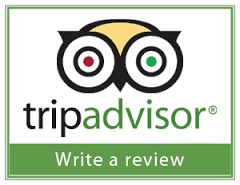 And one thing important to be known, about all types of tourist excursions that we offer for you are: "Private Tours". it means, in this trip you will not be joined with other guests, so only you with your group who will go. also transportation with air conditioned vehicle, and a complete car permit for tourist transport, which laterly will made your travel trip becomes far more enjoyable. So with this system, going to be able to save costs that will certainly be affordable for you, while doing a day trip on Bali island. with maximum passenger capacity up to 6 people in one vehicle. So that you will feel more comfortable on your vacation trip, while visiting all tourists attractions that existed on this Kintamani Bali tour package. "A guide how to find cheap Bali tour package visit Kintamani volcano"
Through this article, Sorga Bali Tours will also share a useful light tips for you whilst on vacation in this tiny island, as explained below, ie. Batubulan will be the first place to be visited that located at eastside from Denpasar town. This area is still a part of Gianyar regency (a well-known district as becomes centre of dances) and stone carvings. And here, you will be able to watch a prominent performances of unique Balinese attraction during 1 hour time. To see the dancing, every visitor will be charged an admission ticket at IDR. 100.000 quoted per person. which passed down from generation to the next with theme from Hindu's epic story of "Mahabharata". A topic narration describes about duality of human life, that basically tells the opposition of good and bad characters as an eternal nature. According to history research, the real legend of this episode was happened more than 15,000 years ago. While, if views from type of this dancing is included into "Bebali" category (with its functions, half for spiritual ceremony and the rest for show). Wali (will only be performed when religious ceremony held at the temple). Balih - Balihan (with functions totally just for fun). So...Barong and Keris included in classification types of dances number 2 (two). Then next visit, you will be invited to see the process of making woven fabric, which is still located in Batubulan region itself. Beside this place is famed with staging dances and stone sculpture crafts, Batubulan also popular for its traditional Batik and Hand Weaving. also demonstration of woven which still using traditional methode that could be an inspiration, and used as local souvenir from island of thousand temples. ...in Celuk village you can also see about Gold and Silver jewelry making process. 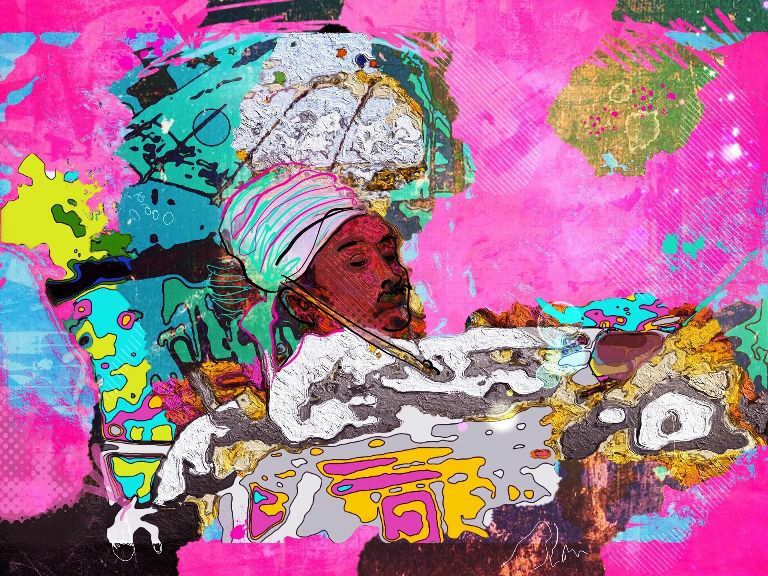 where in its making process, these artists are still using traditional system. ...as well as, the work arts from Celuk's artists has been known throughout the entire world. Batuan Traditional House Compound will be your next destination, here you will be invited to see also visit one of the Balinese traditional house compound. When you visit this place, you will be able to understand about the meaning of "Traditional Houses" based on layout concept of "Asta Kosala - Kosali" and "Asta Bumi" (Balance Concept). Because according to Balinese local belief, if we build a house in accordance with the concept, then all kinds of happiness will come from all directions, and indeed Proven !. especially when they built a building, such as: Home, Building, Office, Family sacred places, Holy temples, and others. And here you will be given an explanation about this base concept, which in accordance of: "Tri Mandala" or "Tri Angga". Nista Mandala / Outer yard, which covers the gate of building outer yard (in Bali often built with name of "Angkul - Angkul") as a barrier from the outside yard. If in terms of "Tri Angga", Nista Mandala is symbol of "Legs" in our limbs. In addition to Angkul - Angkul will also be built "Aling - Aling" as a repellent all kinds of Danger in the astral world and it can protect us from all kinds of negative aura (evil energy). Usually on Aling - Aling will also be placed a Ganesha statue (in Hindu mythology Ganesha is Son of Lord Shiwa with Goddess Parwati as "Repellent"). And in Tri Angga, middle yard is symbol of "Body" in our limbs. #. East part there is a building called "Bale Dangin"
#. West part is building for "Bale Dauh"
While in the #. middle there is one building of "Bale Gede" (which usually used to carry out various kinds of ceremonies, such as: "Death ceremony", "Tooth filing ceremony" "Wedding ceremony" and others). Utama Mandala / Holiest yard, there will be several building shrines, which common used for daily praying. If in Tri Angga, this utama mandala become symbol of "Head" in our limbs. And direction that commonly used for this Utama mandala buildings is at "Northeast" (in Hindu terms often referred to as "Ersanya") with its exit door facing to south side (ocean). in addition also being central craft of furniture in Bali. And in this place you can see clearly how was the skillful from the wood artists chiseling when create an amazing work arts. all the expertise that they get in general are also the ability inherited down - for next generations, and even some of self-taught ability. Even, there are also art schools which actually teach about the particulars how to engraving, especially for younger generation. that become center art of paintings with the existence from its arts galleries. Also supported with several art museums that makes Ubud area as a village becomes goal of inspiration to all artists paintings. such as: Rudolf Bonet, Walter Spies, Antonio Blanco and many others of great artists who cherish the presence of Ubud art village. one of the famous movie's star Julia Robert also held filming their movie titled: "Eat, Pray, Love" which everything's done in Ubud region. In reality Ubud does have a very beautiful charm and exotic natural countryside. such as: Ubud holy monkey forest (Sacred Bali native animals), Ubud art market, and Ubud royal palace. which located at Bedulu sub-district - Gianyar regency. and this hindu temple was very famous throughout the world. as a historical legacy which protected by the local government laws of bali. namely: #.Ganesha statue (in hindu mythology Ganesha is a son of Lord Shiva), #.Buddhist sculpture with style meditation of Vajradatu, and #.Men Brayut statue (a mother with many children). Inner yard there is a cave with small hall, and inside the cave there are 3 artefacts found, such as: #.3 pieces of Linggayoni (phallus) symbol of Lord Shiva in the form of Tri Murti ie: "Brahma - Vishnu - Shiva", #.1 Ganesha statue, and #.Buddha's head statue. while on left side of the cave there are several locations of holy shrines hindu buildings. ...and must be paid at the front gate before entering the elephant cave temple area. 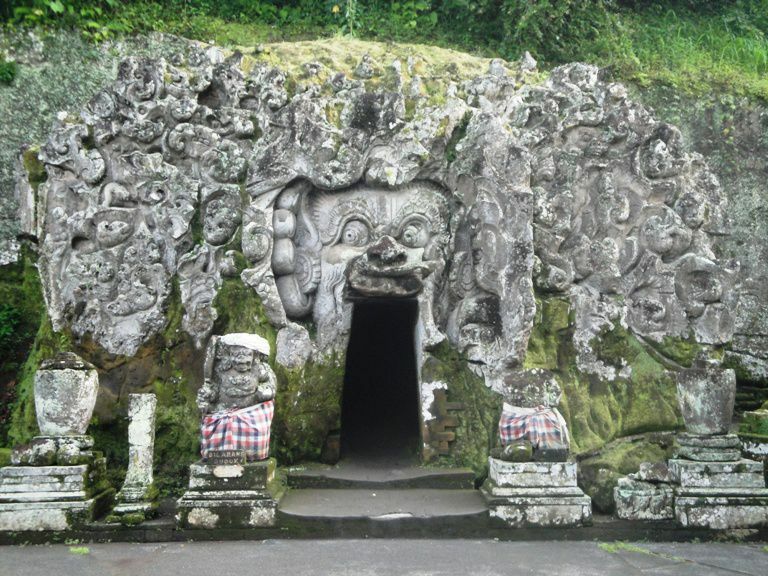 Goa Gajah Temple: "Historical Site Hindu Bali Elephant Cave Temple". If you wish to enter Holy places, you obligade have to wear "Sarong" or "Scarf" as respect attitude to the existence of Bali Sacred Hindu temple. Strictly forbidden to entering temple especially for "Women Under Periode of Menstruation". ...which located in Tampak Siring region. will be there so many people to held this ceremony. 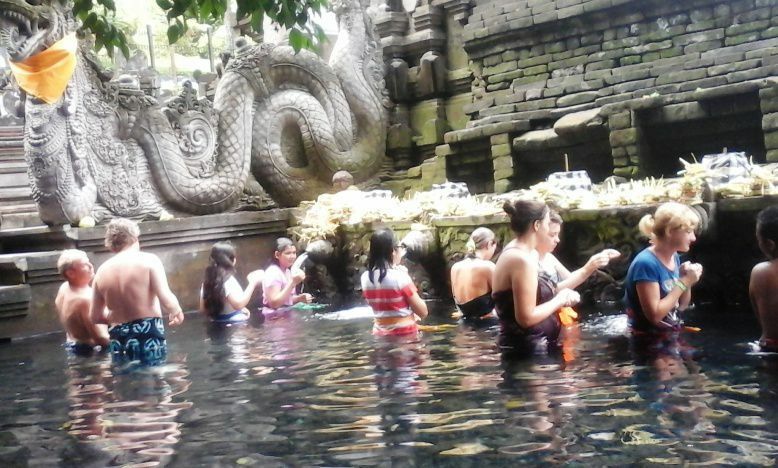 and to purify back the mind after take a soak in the pool water of Tirta Empul temple. while temple ceremony routinely carried out every 6 months (210 days) in balinese calender. Outer yard there is a shrine under a big tree that already hundreds of years old. Middle yard there is a large building with function as a meeting hall, and next to the building with split gate in a separate area there are 3 ponds (which common used to held a purification ritual / ablutions ceremony). Inner yard there are several buildings decorated with beautiful traditional balinese style completely full carved, and one big Tepasana which tied by 2 dragon statues. The name of Tirta Empul cames from uric word of "Tirta" means "Holy Water" and "Empul / Hampul" means "Come out from the ground", and in inner yard also has few artefacts which all based on power of Lord Shiva. that built during the reign of the first Indonesian president, namely; Ir. Sukarno with vice Moh. Hatta. and must be paid at the front gate before entering Tirta Empul temple. Tirta Empul Temple: "Miracle Spritual Healing Holy Springs Temple" | Tampaksiring Bali. Coffee plantations, Fruits and Spices will be your next destination to visit a small village called Kayu Amba - Sekar Dadi - Bangli regency. 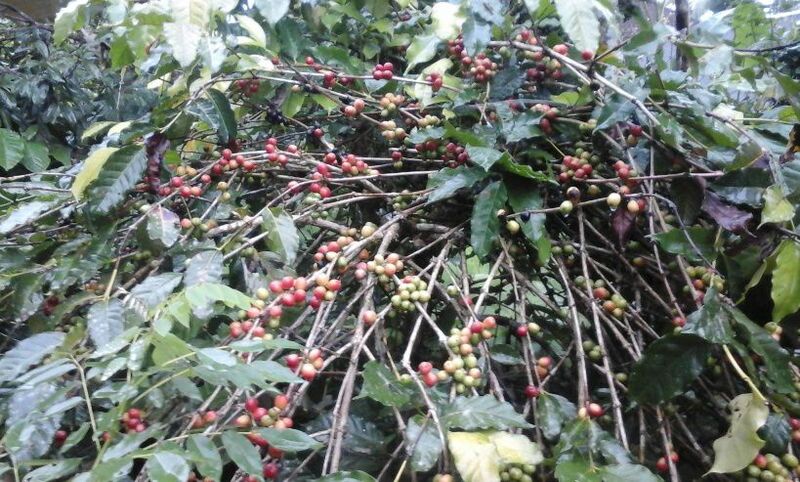 In this area, you can see the plantation of coffee, cloves, fruit, and all kinds of tropical crops, especially coffee. Here at this place, you will also get details information to see the processing of coffee beans that still using traditional methode. this is a kind of coffee which processed from animal droppings Luwak (civet). and after obtaining the fermentation in the mongoose body itself. Next step the coffee beans will be taken and processed with a hygienic system but still using a traditional ways. thus making the existence of civet coffee increasingly becomes popular right now. Besides coffee, there are also many other spices and tea that made out of roselle flowers, lemon grass, Ginger and others. So, a visit to kayuamba - sekar dadi will made your day more attractive and full of memorable experiences. 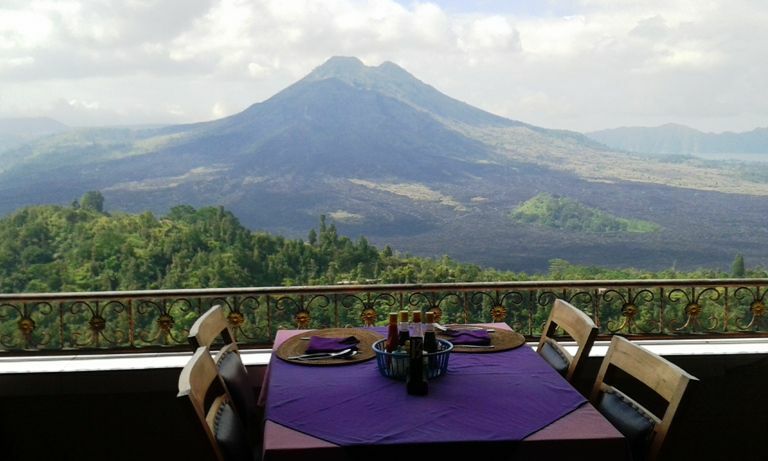 which is adorned with stunning scenery from Volcano and Lake Batur Bali. even almost all restaurants also provides kosher food menu or vegetarian menu according to your taste variation when you have lunch in penelokan area - kintamani. All restaurants here are also in accordance with hygienic procedures, or based on existing health standards. So you do not have to feel worry about the condition of the dishes served at every restaurant in the area of Kintamani - Bangli. 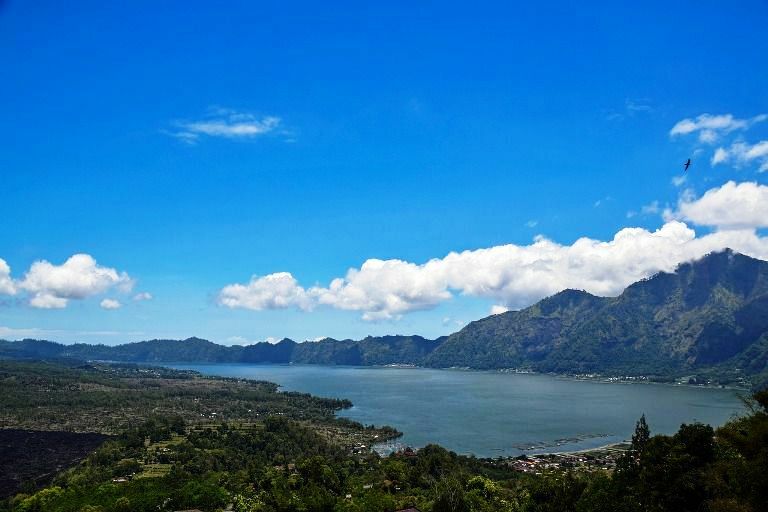 while you can also enjoy the cool weather from mountain range (volcano) and its breathtaking batur lake. 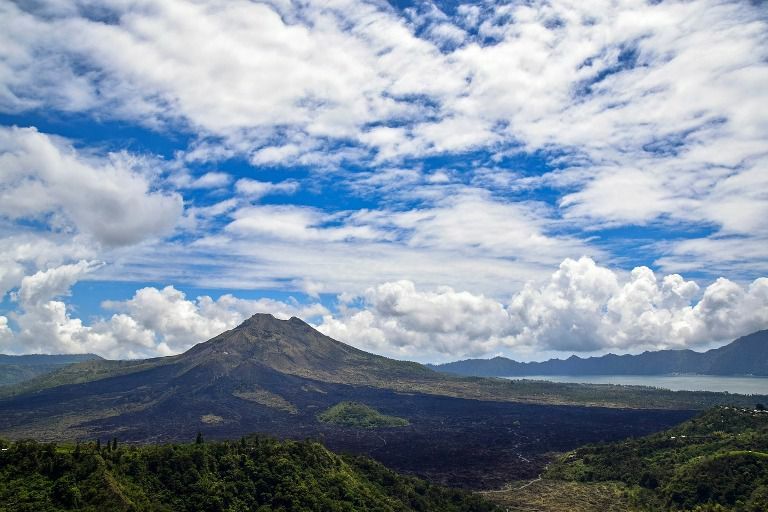 slightly additional information for you to know about Mount Batur is a volcano that found in Bali located at Penelokan - Kintamani - Bangli - Northeast Bali. Batur mountain has erupted more than 26 times, based on records from "Museum Geopark Kintamani", which the first eruption began in 1804 and the last eruption which occurred in 2000. From these eruptions thus making a huge puddles of lake with area about 16 km2, located right on the slopes of batur volcano. that also has brought a huge impact and caused much damage to the infrastructure of existing buildings around Bali. (#. Beratan / Bratan lake located at Candi Kuning village - Bedugul - Tabanan, and #. Buyan lake with #. Tamblingan lake situated at Singaraja North Bali) very useful for water irrigation (Subak) to irrigated all rice-fields around Bali island. and must be paid at the front gate before entering Penelokan - Kintamani. Tegallalang Ricefield Terraces, will be your last trip before turning back to the hotel, to visit a small village called Ceking. 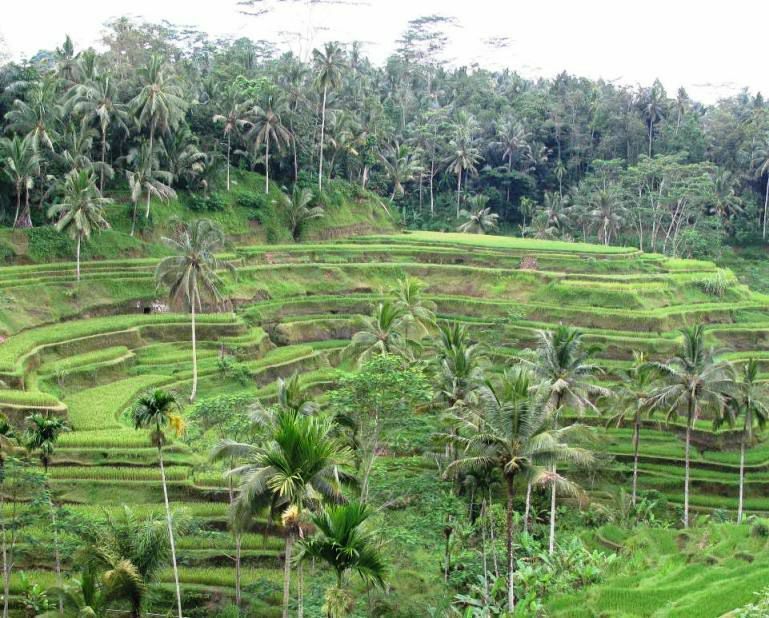 Here, you will see a real beauty of ricefield terraced which common called as "Subak Tegal lalang". ...thus made many tourists willing to stop and take a walk around just to view the best panorama of Tegallalang bali countryside. and must be paid at the front gate before entering Ceking area. and all stuff that they make here normally made on order to be sent overseas. Finally...that's all the explanation of Kintamani Bali volcano tour from us. Can't wait to bring your whole family on a Kintamani trip? For detailed Information and Booking Kintamani Bali Volcano Tour please "CONTACT US" Sorga Bali Tours (Best Bali Holiday Packages).